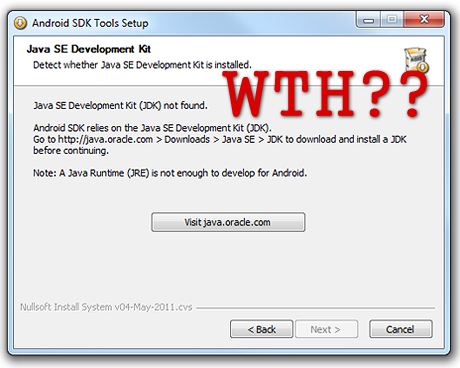 So while trying to install the Android SDK tools in my work machine today, I came across a rather annoying roadblock. 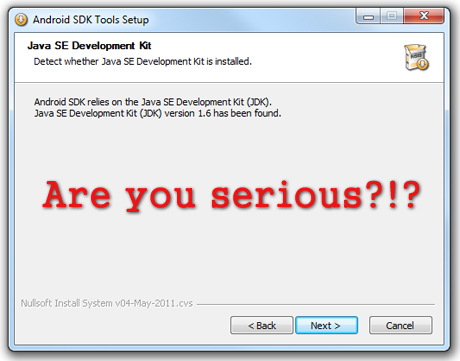 The setup wizard could not locate the Java SE Development Kit and wasn’t letting me continue. This was particularly frustrating because I DID have JDK installed in my system and I had set the right path in the windows environment variables too. As it turns out however, after about an hour of poking around, hitting the ‘back’ button in the installation window and continuing with the installation gets rid of the problem. And as silly as this sounds, this was the only way I could get it to working. Cancelling the installation and retrying doesn’t get rid of the problem either. Hitting on the back button and continuing from there on seemed to be the only solution. Now that’s just too shameful of a bug there.